Impressionism is a 19th Century Art movement which started with a group of artists from Paris. During the 1860’s these artists entered their paintings for exhibition in the Salon but their work was rejected. Instead of the Salon they were reduced to exhibiting their paintings in the “ Salon de Refusés” where rejected works could be shown. In 1874 the group organised the first of their own exhibitions. This received much negative criticism from Art critcs who wrote in the newspapers about the exhibition. 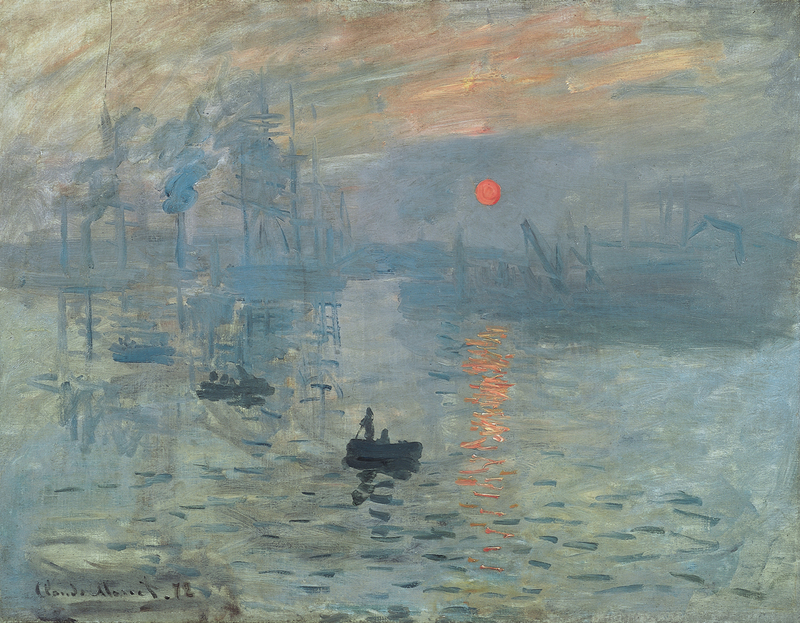 The name “ Impressionists” was given to the group by the Art Critic Louis Leroy after the painting “Impression; Sunrise” by the artist Claude Monet. The group kept this title of “Impressionist” for all of their eight exhibitions together. Their last exhibition together was held in 1886. Impressionist painting is characterised by; visible brushstrokes, a concern for light and using everyday scenes as the subject matter. Many of the Impressionist paintings were painted outdoors “Plein Air” where the artist has to work quickly to capture the scene before the light changed. Visible Brushstrokes ; broad strokes of paint quickly capture the essence of the subject, rather than its details. Optical Mixing; Colours are applied side-by-side with as little mixing as possible, creating blends. The “optical mixing” of colours occurs in the eye of the viewer not on the artist palatte. Absence of Black ; Dark tones are produced by the mixing colours of colours rather than using black paint. Wet on Wet; Impressionist did not wait for one layer of paint to dry before painting another layer on top- this technique produces softer edges and the intermingling of colour. Photography; The Impressionists were influenced by the new Artform – Photography. They were interested in capturing the “ snapshot” effect where a momement could be frozen in time and fleeting light could be captured. Photography showed the Impressionists for the first time that parts of a picture could be out of focus and that the composition could be cropped or cut -off . Also the impressionists learned from photography how to use studio lights to effect change in light on their subject. Japanese Prints. Paris in the 19th Century was full of new goods that were being imported from the far east – among them were prints Japan. The prints showed a differerent approach to compostion – instead of centering the subject in the middle of the painting – Japanese prints often placed the subject off-centre, in a more dramatic composition than in the European tradition. 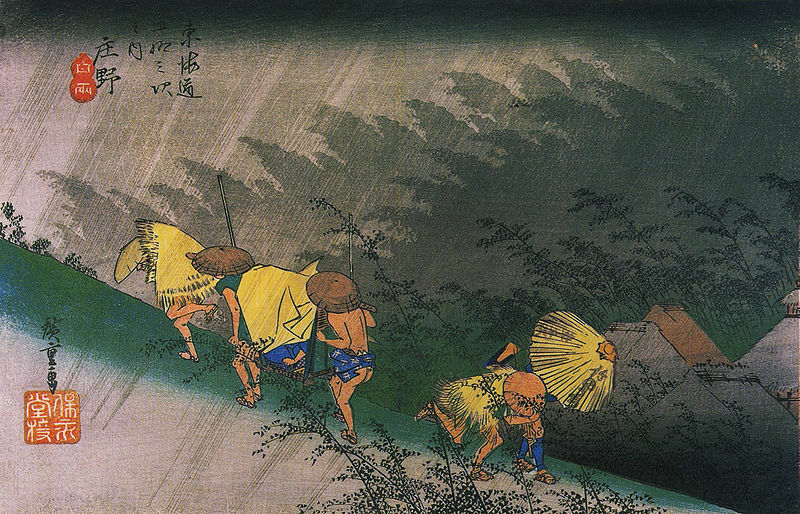 Japanese Prints often showed everyday imgages of ordinary people as their subject matter; this had an influence of the choice of subject matter by the impressionists.